Missed the opening gun and initial rush but nice to make some contacts tonight, almost all on 20m. Thought surely I was misreading a call sign but a very patient Bulgarian Op kindly repeated for me as it sunk in that DX had rolled into my shack this evening. What a nice surprise and many thanks to LZ2RS. Big signal again tonight down here was NQ2W. Must be a pipeline up I-95 to NY from FL. Tnx for the contacts and for this nice, low stress event. My first Sprint in a long time… Just a few QSOs but had some fun. Maybe next time we’ll dig out the K1 and battery pack. Thanks to WB5BKL, NQ2W, WA8ZBT for the contacts. Well Weeeee Doggies as Jed Clampett used to say. You know, the father of the lovely Lady of the Hills, Ellie Mae! Well I was not shooting at some food, nor did I find some crude, but I do believe the contacts were just about as hard to come by. Northern most QSO was VE2VTS, and western most was NK6A. I could hear N0TA, but with me running 1 watt, he could not hear me, although I tried several times. I also heard a WA stn giving his report, but missed his call. 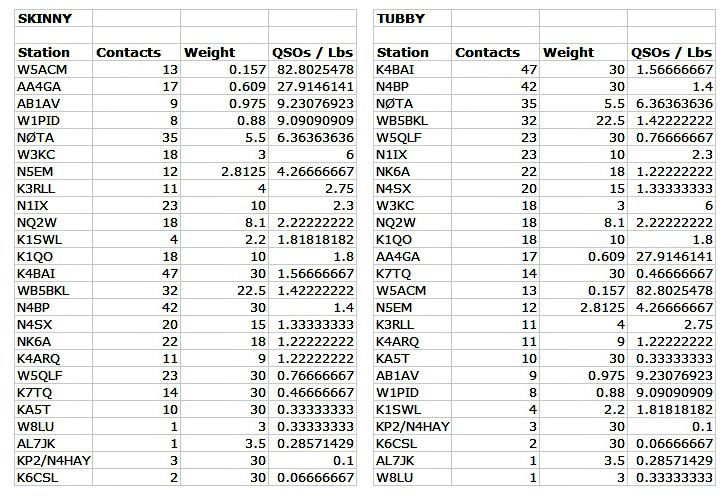 Now, once again I worked 3 different TX stations, with 4 of my total contacts coming from there. What in the heck are you guys doing out there? Maybe I have a TX lobe on my antenna, those guys are always showing up. The last station of the evening I worked was N5GW with 2 watts . . . good job! I finally hit the off switch around 10:25 eastern as there were no new Callsigns to be heard and things were just dead dead dead here. I missed K1QO . . . where you at woman? I did have me some fun though guys and I appreciated every QSO. Thanks to you all. K1 at 5 W to a 2-element mini-beam at 25 ft for 10, 15, and 20 meters and an inverted V at 40 ft for 40 m. 15 m allowed one QSO with NK6A out in CA. 20 m was good for 12 more QSOs from WA, down the coast to CA, through TX , and all the way to FL and NC. 40 m added 7 more QSOs from TX up to ME and Quebec. QRN on 40 m was pretty bad with the stormy weather here in the NE. Two banders with NK6A (15, 20), K4BAI (20, 40), N5GW (20, 40), W5QLF (20, 40), and WA8ZBT (20, 40). Thanks for the contacts. Have a safe and fun Field Day! QSOs by band: 20: 11. 40: 13. 80: 2. Time of operation about 1:33. 20M was pretty good to NA. I thought I heard LZ2RS once, but no QSO. Closest QSO was NQ2W. Best "DX": NK6A and WB6QQR in CA and W7OM in WA. 40 and 80M were relatively quiet despite electrical storms in the area about two hours earlier. Worked two other GA stations on 40M, so there was no skip zone. Again, best DX was NK6A. 80M: Worked only N4SX and N5GW. On 20M heard and called AB9CA in AL, but Dave didn't hear me. On 80M, heard and called WB5BKL several times, but Nick couldn't hear me either. We could use more activity in these sprints. Thanks for all QSOs. Rig was K3 to 100' wire. Had only an hour and lost about half of that to a phone call. Looks like 6 on 20 and 5 on 40. No two banders. Was fun while it lasted. Noise here was not too bad. See everyone next month. I fired up the K3 but realized the NiMH bats were not fully charged, so I used 2W instead of the usual 3W. 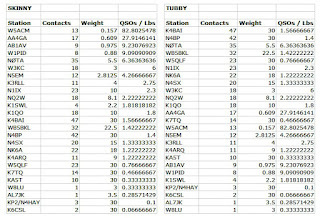 Only one station was heard/worked on 15M (NK6A); most of the remainder on 20M or 40M. Only three contacts on 80M. Two banders with NK6A, WB5BKL, K4BAI, NQ2W, and WA8ZBT. I was surprised and thrilled to work LZ2RS who heard my puny 2W signal on 20M and called me. K3/10 @ 5W to 15 and 20M delta loops, a 40M dipole or a 40M extended double Zepp. QSOs on 20 40 and 80M - 11 S/P/Cs total. Tried 15M - but only the RBN heard me. The 20M delta loop fell earlier this week - but I got it back up in time. K4BAI had the best signals on 20 and 40M. My semi-neighbor WA8ZBT had the best on 80m. Very pleased to work three stations using less than 5W. Nice to hear a few new calls but activity seemed down a bit. My thanks to all. Had fun.